I can’t thank You Barb, and Scottish Stained Glass enough for my awesome window! It is amazing and keeps me in my kitchen extra hours. I look forward every morning to seeing it when I enter my kitchen. Dearest Barb, I do so appreciate your design execution and use of the glass types you suggested. You’re the best! I LOVE them. Interesting thing that was unplanned is we have some very old leaded glass windows from an old book case that we are using as door transoms on 4 doors. They have the exact same design as the diamond windows. So excited. We never thought about having them match. We lucked out. Thank you for your help Barb. It has been a truly great experience. I wanted to write you a note to let you know how much I love my stained glass! It looks exactly as I had hoped. Special thanks to Nicole for being patient with me during the design process and to Nick for his expert installation. I appreciate the work they both did in making the final product absolutely perfect! Thanks so much. The Scottish Stained Glass experience was GREAT! We love our new glass windows which greatly enhanced our entry way. The entire process was very thorough, and kept me informed at all times. The installation was not only professionally performed in a very respectful manner, but the installer took the time to explain the process, step by step. Nancy did an incredibly beautiful job, the detail is impeccable and we can’t wait to cherish this piece for decades, to eventually pass it on to our children someday. The entire process was impressively streamlined and all staff were patient and understanding, polite and friendly. I Love my sidelight and half moon leaded glass windows! They are top quality. The company was very professional too. I am so Happy with my leaded glass! They are Beautigul! Thank You. We had a sidelight installed and tinted our windows with solar film. Wonderful experience all the way around. Our leaded glass sidelight windows are beautiful! The whole process was very professional and we are very pleased with the results. I highly recommend Scottish Stained Glass. We are so pleased with our sidelights and we get compliments from visitors all the time. We were delighted when SSG called to tell us our sidelights were ready for installation much earlier than promised! Our designer was knowledgable and delightful to work with. A great experience all around! Loved working with Scottish Stained Glass. EVERYTHING about the design and installation was easy (seriously…..the hardest part was waiting for my masterpiece to be created!). Rebecca was my sales person and she was patient with me and was well prepared with design ideas and samples. We spent time looking at designs until she had an idea of what I liked and was able to make suggestions for me. She had a lot of sample glass so we were able to test colors and designs on my window! Stan came to install and it could not have been easier. The windows are AMAZING and give our older home the perfect touch! I absolutely LOVE my new windows…they are gorgeous and EXACTLY what I had envisioned. Thank you!! Awesome experience from start to finish. Rebecca understood exactly what I was wanting for and Nicole designed it exactly as I pictured it. And Sid installed it quickly! The timeframe was exactly what they told me it would be. I love my new front door window! They did a great job. My window is exactly what I expected to be. Great experience, beautiful work. We will definitely work with them again! We absolutely love our new stained glass. The entire staff was knowledgeable & very professional. Meghan was a joy to work with! It was my first experience with Scottish Glas, and a learning experience for me. The designer was very helpful and patient in helping me explore different designs. The installer was great. I’m very happy with the end result. Extraordinarily professional staff who delivered an extraordinarily high-quality product — exceeding expectations. Sorry it has taken me so long to respond to you but I have been pretty busy lately. I do, however want you to know how very pleased and satisfied Betty and I are with our new front-door sidelight panel. We enjoy it tremendously! I would also like to take this opportunity to thank you (the designer), Lena Goods (the project manager who coordinated the panel creation), and David Dillon (the installer), for your professionalism and care and attention to details. A great job! Everything about the job was excellent and above average. Everyone was kind, courteous, accommodating, and flexible. The follow through was outstanding. Recognize Excellence: Jim Stare was excellent. Rico, the project manager. Joe, the owner. I couldn’t say enough about how much we like them. Everything from start to finish was done in a professional Manner. Right from the start I realized I had nothing to worry about. I received amazing service from Scottish Glass, especially from Megan who has a great eye for design and helped me design my beautiful windows on the spot! I recommend them very highly. We also had window films put on some of my windows for privacy. Again, a great product that was easily installed and looks great. From the very beginning to the final install, all involved were completely professional and talented. My home now has gorgeous jewelry to adorn it which I admire every day as the lighting changes. What an exquisite and classic addition to my Home !!!! thank You , Everyone. I Love it !!!! We are very happy with our new Scottish Stained Glass door and it will give us the privacy we had been lacking. Dave did a great job. He was very professional in his work. Thank you Dave. I am thrilled with my stained glass window and have enjoyed showing it to family and neighbors. The entry is now elegant! Everything was handled very professionally. I would recommend to everyone. I am thrilled with my stained glass window side light. The design is perfect and I have already received many compliments. Hi Megan – we absolutely LOVE it!!! We now want the study door done when we get to that point so will reach out then. Thanks so much for all your help, you were brilliant!! I am so happy and pleased with the entire service provided by The Scottish Stained Glass Team. I am so proud of my stained glass window and my home looks amazing with this addition. The staff and customer service was outstanding, I am vey pleased with the overall service and LOVE MY WINDOW!!! Everything was great. I asked for a the installation to be completed before a specific date (as I had company coming to stay with me) and you were able to accommodate my request! The installation was done well and the area was cleaned up nicely. When Megan showed up at our house with all the glass selections I felt overwhelmed, but she immediately helped me zero in on my style and it ended up being fun! The side lights looks fabulous!! The windows exceed our expectations. They really add to our family room. The experience from introduction to installation was a pleasure. We highly recommend Scottish Stained Glass to anyone in the market for high quality stained glass windows. The entire process was painless. The staff were professional and the results on time and beautiful. Everything was great! I love my sidelights! You met or exceeded every expectation. Thank you so much. Our experience with Scottish Stained Glass was wonderful. We first met with a designer at a convenient time for us and she gave us several good options to consider. Upon selecting one, the window was built within the anticipated time frame. The installer actually showed up a little before time and it took no time at all to install our window. From beginning to end, the process went well. I have no complaints. I love how the new side window enhances our door and entryway. Everyone I worked with or spoke to was kind, friendly and professional. When I was called that the window was ready, they installed it the next day. I am extremely pleased with the whole process. How can we improve? We can’t think of anything you could do to improve your service unless, if you buy two you get one free!!!! Testimonial We truly love our stained glass window art. It exceeded all of our expectations. We highly recommend Scottish Stained Glass to anyone thinking of improving their home with beautiful stained glass. I love my stain glass window and have had many compliments Scottish stain glass is great! I made a series of changes from the original design, both in form and glass color, over the course of several weeks. Lena made each adjustment and emailed revision after revision in a timely manner, with professional courtesy, never losing patience. She even dropped additional glass samples off at my house using her personal time. Everything appears to have been done perfectly. We are extremely happy with the result! Testimonial We received outstanding quality and service on our stained glass project. This was a great solution to a difficult window problem and Scottish Stained Glass provided a great result! Fabulous company and wonderful product! This is the third time I have used Scottish Stained Glass. I use them for every home I buy! Hello, the windows look better than I thought they could. The customer service during the whole process was great. The installers customer service was first class all of the way. He did a great job! I would refer anyone that is looking for windows to you. Great company and great craftsmanship! Thank you! 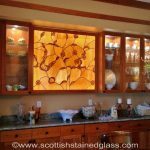 I selected Scottish Stained Glass from a Home & Garden Show last year in the fall. I was impressed with the different selections to choose from. Rebecca took the time to go over my options for 2 windows I wanted new glass. The installers did a remarkable job, especially on the rather large glass in my master bath. Apparently the largest of their install history. It’s beautiful and glad I took the time to carefully pick the right company to go with!! Really a great looking product. Accomplishes just what we were looking for. Many thanks. 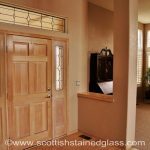 Scottish Stain Glass is a great company to work with, from the person who took my call and set up an appointment with the artist, to the artist herself, and to the installers, David and Francisco were all professional. I definitely would use them again. The designs are beautiful and the craftsmanship is excellent. Ours was a difficult task as our stained glass window had to be removed, reframed and replaced in a way to make it waterproof. Sid and company did a great job. We love our new stained glass window! It makes the room! Thank you for the beautiful design and install! We love the stained glass and it was a great experience. We look forward to future projects. Designer presented a lot of good ideas. The installer was friendly and courteous. Installer arrived on time, as usual, and did a great job taking out the old glass and installing the new. They were very neat and clean and were good about not letting my dog slip out the front door!!! 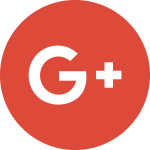 Lauren and I were pleased with your quality of service start to finish. We are very happy with the stained glass windows. Impressive! I could not be more pleased with the beautiful windows in my bathroom! So worth the wait. I love the design. The workmanship is outstanding. The install was perfect. Thank you Scottish Stained Glass!!!! My designer was very attentive, very experienced, and gave enough options to choose from but not too many to be confusing. I am very happy indeed with my new window. ​​Thank you, thank you! The window is just wonderful. Your installer was most pleasant. We are VERY happy. Should have done this sooner. Everything went great for us! We a few questions, which were promptly answered. The entire process was flawless. Testimonial After we recently bought a new, we have had a lot of work done. Working with Scottish Stained Glass was one of the best experiences we have had and the perfect solution for our front door. We are no longer living in fish bowl and have a beautiful front entry. Scottish Glass staff and installers did such a great job. The design was innovative and perfect for our house. The install was on time, carefully done, and very clean. This is our second time with Scottish Glass and we are 100% thrilled with the results. We were very pleased with every step of the procedure from design to installation. Our glass is absolutely beautiful! Your staff was so friendly and so easy to work with. I would definitely recommend Scottish stained glass to friends and family! The process was easy beginning to end. I was particularly impressed with the designer. She was very intuitive understanding my design ideas and added great ideas. It was an interactive process that yielded a great product. I was very pleased throughout the process and thrilled with the result. You are all amazing: organized, talented, careful, friendly. If I were younger, I’d want to work there. All of your employees were very professional, from the no pressure sales/designer to the installer. The glass looks fantastic! Thank you very much. The designer was great. She thoroughly understood my goal and achieved it with the initial draft design. The CAD proposal was exact and installation began sooner than I thought it would occur. Please pass along our gratitude for the quality workmanship of the stain glass windows installed this past weekend. We are delighted with how they turned out. God Bless! Very pleased with the stained glass windows and installation. Windows were exquisite and installed very professionally. Love them, love them, love them. My husband has wanted stained glass windows beside our front door for 22 years. We finally said its time and could not be happier. The designer made my job so easy, and the final design was PERFECT. The installation was a breeze. The staff was very helpful in letting us wait several months to have them installed because we had painters in the house. Was greatly appreciated. No pushing just to get final payment. The result is absolutely breath taking. Would recommend these people 100% – the best – and so talented. the courteous, professionalism that you and yours each demonstrate. My glass is in and it is remarkable! I love it! Thank you so much. We will enjoy these for years to come. I love coming around the corner and noticing the light illuminating my iris’. We are very pleased with our leaded glass windows. The process from initial contact to installation was exceptional. We like to present our ideas, but then want honest opinions of our ideas, good or bad. We got this honest approach from start to finish. Nicole did a great job on the design, matching the windows to my door windows perfectly. The installation came in ahead of schedule and installer was meticulous. The stained glass door and adjacent windows were beyond our expectations. It was one of the best home improvements that we have done since we bought our house. We are so happy with the cut glass design next to our front door and the half moon window above the door. We will use Scottish Stained Glass again and would highly recommend others to as well. The stained glass provided by Scottish Stained Glass is beautiful. It exceeded my expectations. The designer worked with me to come up with a creative design and the installation was professionally executed. The windows were expensive but, the quality is excellent so you get what you pay for. 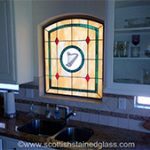 I recommend Scottish Stained Glass to anyone who wants to beautify their home with high quality stained glass. This is the best and easiest home improvements we’ve done to date. The process was painless from start to finish and the staff was great. We love our custom window and we highly recommend Scottish Stained Glass. I was very pleased with the professionalism of the staff as we met for the design and future purchase of our stained glass window. The craftsmanship and quality of the product was excellent. We are very happy with the outcome. Thank you Scottish Stained Glass! The design, workmanship, and installation are exemplary. The installer was actually ahead of schedule and asked permission to come early. He was very thorough, careful, and efficient. He was done before actually scheduled to be here. Worked great for us! We love the stained glass you did for our church thanks so much and looking forward to getting some more. The window is so beautiful! It is truly stunning. Thank you (and the entire team) for making this process so enjoyable and easy. We are really happy with our new glass! The installers were really great, and very neat. We regret waiting so long to make this improvement. We had beautiful Scottish Stained Glass in our previous home and were disappointed to leave it behind; though it was a great selling feature. We love the elegance our new leaded glass adds to our current home. We are so pleased with how it turned out. Thank you. We are over all pleased with Scottish Stained Glass as a company. They do professional work and the quality is far above all others. 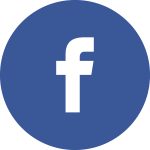 We are three time repeat customers and highly recommend them and will use them again. We really enjoyed working with the professionals at Scottish Stained Glass. The price we paid for our two windows was higher than I anticipated it would be. Now that they are installed and we get to enjoy them every day, I state unequivocally that they are worth every cent. The craftsmanship, design, and installation are first rate. The staff were courteous, professional, and really believe in their product. Thank you. Perfect in EVERY way…I am so glad I stopped at your booth at the Austin Home & Garden show because I now have a GORGEOUS piece of cut glass on my front door!…Thank you! I am ‘over the moon’ happy with my decision to have a custom made, one of a kind piece of cut glass for my otherwise plain front door…Everyone comments on its beauty and it adds so much character!…Your designer, customer service, installation all are TOP NOTCH!…I recommend you to anyone who is interested in this look…Thank you!! Nicole, the designer, was a pleasure to work with and very knowlegable. She answered all of our questions, helped create a design for our sidelite windows that matched our door and stayed within our budget. Glass arrived on time and was exactly what we wanted. The installer was very professional and did an excellent job. He also noticed that the seal on our new (2 months old), leaded glass front door was broken. If not fixed, over time the glass would fog and canning would rust. I would have never noticed this small imperfection that his trained eye observed! Thanks to him, the manufacturer is coming back to install a new door. This is a very professional company and would highly recommend them to family and friends. Very professional! Would recommend to friends and family!! Our designer Megan is a joy to work with: very creative, accurate, and engaging. We truly appreciate her work. Thank you all for sharing your gifts and talents with us all the way to the very end. I’m going to sit here at my desk for the rest of the afternoon, staring and smiling at a job well done. The window is beautiful!!! A friend of mine was over yesterday. I took her into the room and had her look in that direction for the “new thing.” She couldn’t find it until I pointed the window out to her. It is because the window looks like it has always been there it fits in so well. To me, that is one of the best compliments it can receive. I couldn’t be more pleased with my experience of working with Scottish Stained Glass. From the moment my designer, Megan, walked in my door, I was blown away! From designing, to explaining, to pricing, then changing my mind a hundred times, to using the showroom as a guide, to installation, follow up, and customer service, I was pleased. Plus, I absolutely LOVE my new stained glass doors!! Other companied should use Scottish Stained Glass as an example as to how to run their own businesses! We want to thank you for the time and care that you took to design, create, and ship our windows. They are gorgeous! You were able to take an idea and make it into a reality. Working together across 1,200 miles takes a lot of trust. You took that trust and fulfilled all of our expectations. Thank you, Megan for your design, Mike for your artistry, and Lena for your encouraging words as I opened the best birthday present ever. When they are finally installed, we will send you a picture and sing your praises once again. The designer and Installers were professional and very friendly. The designer was extremely helpful in helping me pick out the design/pattern for my window. I would definitely recommend them and use them in the future. You did everything perfect. Most impressive. Please note, installers were not involved in my order, but your entire staff was most helpful, from Nicole Craig to Nicole Nix, to Mike Kinsey to Lena Goods. I also can’t thank you enough for getting the shipment to me in such a timely fashion. I expected the panes in the middle of April, but received them 11 March. They look amazing. You all do such awesome work! 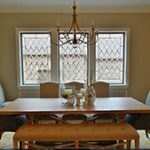 Our entire experience with Scottish Stained Glass was fantastic, from meeting Nicole Craig at the Home and Garden show through the design process and finally installation by David Dillon. The door and windows were everything we hoped for. We would gladly recommend Scottish Stained Glass to our friends would not hesitate to call on them again ourselves. We are very happy with our new stained glass window above the front door and two side panels. The installers were very nice, clean and informative and professional. Nicole was very helpful in helping us make the right decisions on design and type of glass. I would highly recommend this business! The stained glass sidelight exceeded my expectations. Thank you! We were so pleased with the professional in-home consultation with Nicole. Her time and thoughtful attention to our plan and the details was so satisfying. We love our new window. Patricia was great. She arrived on time, was very professional, gave good suggestions and left me a copy of our proposed design. We will definitely use your company again. Thanks. The quickness of a friendly personal response to my inquiry was one of the first things that convinced me to take the next step. Terri, the designer, seemed to know exactly what I wanted and gave some very helpful guidance and suggestions. The web site and it’s examples of the finished products, convinced me that this was the company we should use. We are extremely pleased with our new glass window. It accomplished the desired result in our guest bathroom – obscuring a less than attractive view without significantly limiting the light in the room. You all did great… And will refer and endorse your products and service! The windows are beautiful and the service was excellent! I am delighted with both of the windows. I love the designs done by Megan. The installers arrived as planned, installed the windows in a remarkably short amount of time, and left nothing for me to clean up! The people at the office have been courteous and easy to work with. This is related to the Law Office Project. The stained glass doors are beautiful! Excellent service and product! Would highly recommend! The windows are perfect. Exactually like I expected them to look like. Love them. Great Job! We love our leaded glass!! This is the 2nd time we have come to Scottish Stained Glass for our home and we love it. It makes such an amazing difference to our home. 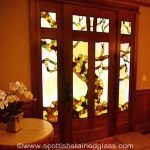 My wife and I have wanted custom stained glass for our entry doors for several years now. We truly enjoyed our experience with Scottish Stained Glass beginning with the designer and ending with the installers, both were excellent. We now have a one-of-a-kind entry that is a beautiful. We also, were just a impressed with the finished product . . . a most beautiful window. And a joy to actually meet the two men that created our window, they seemed just as pleased with their work as we are. David and his helper (can’t remember his name) were also just as professional in all aspects of installing our window; and, a delight to deal with. We are thrilled with our stained glass windows and all the leaded glass windows that were installed. We highly recommend Scottish Stained Glass to all our friends and family. The quality of the windows is excellent. We also value Patricia our designer for her assistance in selecting & designing our windows. The instillation staff was also wonderful, they were on time, friendly & very professional in their job. We couldn’t be happier! The stained glass in our new home is ABSOLUTELY gorgeous!!!! Our designer was spot on in creating pieces not only to our taste, but she was so right when she said the designs are timeless. When I look at our glass daily, I know in my heart that not only do I adore the designs today, but I will twenty years from now….and forever! Design and colors exactly as expected and spectacular in our home. Installation went without a hitch. Mike and Barbara went out of their way to help me in everyway possible. If I ever need anything like this done again I will not hesitate to go with them again and again. They are the best at what they do and more!!! Thank You. Absolutely STUNNING results. Better than expected. Great installers. Great quality product, the design was perfect as though it was meant for my front door transom. From the first in-home visit and consultation, preview of our design, installation appointment set up and installation….everything went seamless. Everyone from the SSG staff was very professional and most importantly respectful of our house and its surroundings. We really love it. The design work is beautiful and the installation and all work with the entire crew of Scottish Stained Glass was seamless. Everyone was a true professional and proud of their part in the process. The morning light that comes through the glass looks wonderful on the inside of our house and provides the privacy that we were desperately seeking. I have had several comments from neighbors who have noticed the windows at night time when they are illuminated and they put on another wonderful display. Everything was great! We are very happy with the entire process. From the beginning (Appointment) to the finish (installation) professionalism, communication and timeliness like no other company we have dealt with in the Metro Area. 40 years as a homeowner absolutely no other company has made the extra effort for timeliness and communication as Scottish Stained Glass. The job exceeded our expectations from start to finish. The people we dealt with were professional and courteous, and the workmanship is outstanding. We love our new window, and will consider more in the future. A thoroughly enjoyable and professional experience from making original contact, setting the fist appointment, working through initial design, receiving the CAD drawing, scheduling production, and installation of the finished product. Everyone at Scottish stained glass was professional, easy to work with, and very competent. I cannot say enough good things about this company! Love Love Love my leaded glass. I wish I had done it years ago! I love my new stained glass!!!! It is something I have wanted for a along time but was never sure where to start. Nicole came to my house with drawings based on ideas I had given her. Together we went through and tweaked it till it was perfect!! The glass was installed by the gentlemen who created it. They were informative, professional, and obviously perfectionist with there craft. I highly recommend Scottish to anyone wanting to beautify windows with stained glass. The glass was beautiful. That is why I put in another order. Waiting for that work of art, with enthusiasm. Excellent. Fantastic. You gave me exactly what I wanted! We had an unusual circumstance with our remodel and no other company would try to figure out a solution for a window in the master bathroom. Nicole Craig started the process and felt certain Scottish Glass would be able to take care of us. She asked the installer to assist us and David worked tirelessly to come up with the answer! He installed the final window last week and it is perfect! We love it, totally completes our bathroom. I couldn’t be happier. Aspen leaves and the custom door are gorgeous. Our old door was difficult to lock so really like how the door latches and locks easily. Tim did a great job of the install to get everything to operate smoothly. From when we walked into the shop and met Martin, through the design process with Barbara, the very attentive layout and assembly process, and the installation, this whole process was wonderful. We had very high expectations for how these two pieces would add beauty to our home, and our expectation were exceeded. Over the past few years I have ordered four (4) stained glass Family Crests. Each time I met with Megan O’Brien she is very professional, her educational background complimented her abilities to assist me in designing the beautiful Family Crests (Anderson, O’Connell, Ross, Ross). I have shared pictures of these beautiful works of art with family and friends which may result in future sales for Scottish Stained Glass. Everything went very well. Great work from beginning to end. Great job from start to finish. Craftsmanship was excellent. Designers worked very closely with me to get the exact design that I wanted, including selection of colors and glass that would work well with each other. I’m very pleased with the final results. I would recommend your company and team to everyone. The service, the window, and employees are excellent. I am so happy with the window and proud to show it off. 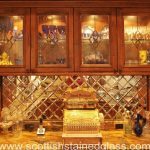 We met Scottish Stained Glass at a trade Show in Allen Texas, their display and the knowledge of what we needed was perfect, we had Ali com to our home and give us some idea’s and a quote. Their quote was reasonable and we ordered three Window inserts. They delivered and installed within the time frame and the installer performed well above my expectations, I would highly recommend them to anyone needing their expertise. Our designer and the staff worked with us to create a set of spectacular glass doors that harmonized beautifully with our contemporary interior. Great job! Extremely easy and efficient from calling to schedule the appointment, to the design appointment, to the sign off on design and to install. We couldn’t be happier! Everything was great. Terri showed a number of designs and made several great suggestions. The end product was exactly as she described and followed the CAD drawing perfectly. The installer was thorough, competent and performed the installation very well. We love our stained glass and everything was perfect! The installer was very professional and courteous. He also did a great job of installing our beautiful stained glass. We love our new window, it is absolutely gorgeous and adds tremendously to our front entry. Thank you for doing such a beautiful, high quality job. Megan did a wonderful job with our design. She is great to work with and very professional. Your installers also did a great job. They did a great job on the glass installed in my house. Nicole was great to work with. She was always very prompt in returning calls & answering questions. Megan is great, very flexible to work with and always has helpful ideas. She spends so much time, each consultation makes it feel like she is your private designer. Installer was very professional, showed up promptly on time and did a great job. Scottish Stained Glass treats its customers with the utmost respect and dignity. From the design process to the finished product, they communicate well, make changes when necessary, and are very flexible in making sure each custom piece is just what the customer wants. The stained glass looks absolutely amazing. We were very surprised at how much it changed the look of the room. This is the second home we have had Scottish Glass do for us. The first was for our mountain home (Aspen Trees) which was designed specifically for us. It is now one of the display glasses. Love the work and designs. We would definitely recommend Scottish Glass to our neighbors and friends. We are very pleased with the product and the service. We are very happy with the overall experience we had with SSG. From start to finish they were professional, engaged and thorough in their approach. Finished product exceeded expectation and truly did add to our appreciation for our home. Well done!!! From designer Nicole, Ali at the office, and David the installer, everything was great. Beautiful side window, that is a perfect accent to our entrance. Our designer Nicole was very professional and great to work with. the installers were on time and did a great job. You folks did such a wonderful job! Your staff is courteous and knowledgeable. They made sure my husband and I were informed and included in all processes every step of the way. Thank you for the wonderful job! I had a very positive experience, from start to finish, with Scottish Stained Glass. Barbara gave me the freedom to create my own design yet gave advise when it was needed for color and texture choice. I love my stained glass window. It was the perfect touch to the front of my house. Thank you Barbara! Great job Scottish Stained Glass! This experience was a pleasure from the beginning. Terri, the designer new exactly what I would like and the installer was an artist. I consider my side windows a work of art and am very pleased with the results. Very happy with my stained glass front door! Our designer, Megan, was absolutely amazing!!!!!! Her design was exactly what we wanted and the finished product is just what we were promised. We could not be more thrilled with our new window and will definitely be calling on Megan again to design a new window for a different spot. It was a great experience working with Barb at Scottish Stained Glass to design and make my piece. The result was exactly what I had imagined. Thanks! I’m so happy I was able to find your company. I am thrilled with my new leaded glass windows. They really helped turn the foyer of my home into a featured room rather than just a large empty entry space. Our sales rep was lovely. Extremely professional and personable at the same time. I don’t have a single creative bone in my body, so working with her and seeing her come up with a custom design right there in my kitchen was very inspiring. I will definitely use SSG again in the future. The 3 stained glass panels I had done are absolutely amazing. I sent pictures of them to my friends and they were equally impressed. They “make” the room. I love them!! Everyone at Scottish Stained Glass was a pleasure to work with! The quality of their work, the friendliness and professionalism of their staff was a refreshing experience! My windows are beautiful, I knew they would be because of the mock up you sent before even starting the project. The designer, Barb, was very helpful in selecting the design. The installer also did a great job and was on time, very polite and took care to clean the windows before the install. Well worth it and would recommend to anyone. Beautiful windows, amazing quality, very pleased!! I was just amazed at how the artist captured my idea in her drawing immediately! I enjoyed participating in the art by choosing colors & glass; then the whole product arrived & was installed just as planned, but it was more than I had hoped, breath-taking! Customer service and contact thru the whole process assured me of progress during creation. Finally, I am overly satisfied with this new art for the price I paid. Highly recommend Scottish Stained Glass for any project of this design. My stained glass entryway adds a special touch to the house. The craftsmanship is superb. I can’t believe it was as easy and wonderful to do this as it turned out to be. We have very small sidelights and she assured us that what we were doing would work. I was not sure it would be worth it but oh my, how gorgeous they are and what a difference it makes in the entrance! My hat off to all of you, it was a dream come true and your designer knew exactly what our taste was and helped make it come true! Thanks!!!! My experience with Scottish Stained Glass has been superb! My initial phone call and numerous questions were handled patiently and thoroughly by the representative. The designer and installer were equally knowledgeable and professional. It is quite refreshing to work with a company whose staff are as dedicated to excellent customer service as those at Scottish Stained Glass. The leaded glass windows I purchased are beautiful and the entire experience was a pleasant one. Thanks to all! My new sidelights and door glass is beautiful. The quality of the workmanship and experience working with Barb and the rest of the Scottish Stained Glass team was fantastic. Thank you for your great customer service. Julie in Highlands Ranch. Everything is perfect, love our new side lights. The installer was early(appreciated)efficient and did an excellent job. The designer did a great job. This was a wonderful experience. The stained glass is just beautiful and is the perfect solution to maintaining the light in our entry way while preserving our privacy. It is truly a work of art and has definitely enhanced our home. The design process really helped us be concise about the look of the windows and the cost. Everyone involved was professional and helpful. We just love it. I was happy to meet the man who built my window, as he also installed it. I could tell that he was very proud of his work, and rightfully so, as the window is gorgeous!! Everything well done. This is the second time we have ordered glass from your company and again this was a great experience. Our front door sidelight and bathroom window turned out beautifully. We are so pleased and it was a pleasure working with Scottish Stained Glass a second time. First I want to say that my designer Barb was amazing. She really pegged what we were looking for. She Responded almost immediately to my every question and request. Our installer, I think his name was Mike was awesome. He came on time by himself to our house. The person who was suppose to assist him was not able to make it, but this did not stop him. He took his time and did a first rate job on installation. He was both professional and courteous to me and my wife. Thank you to both Barb and Mike. The window is beautiful, and we love it.I think our stained glass is incredible and I will recommend Scottish Stained Glass to anyone who ever admires our window. The work was beautifully done, on time and installed to my full satisfaction. True value for my money. Loved that we could work with Nicole and customize our window design. Scottish Stained Glass did a beautiful job making them come to life and handling a difficult installation-putting in windows where none existed before. The light now coming in to our room has transformed our quality of life (and the appearance of the size of the room); we’re thrilled! Perfect! Great communication, customer service, and very pleased with the final product. Will definitely recommend to others. The design process was very beneficial. Megan actually drew out what the design would look like, and the installation was quick and easy. I made a few changes to the design, and those suggestions were quickly incorporated without any problems whatsoever. I will definitely continue to use Scottish Stained Glass for future projects and recommend them to anybody who wants high quality stained glass, hassle free design and great customer service. I love my windows. You did a great job! We replaced two very high windows in our living area. The trick was that the windows were not exactly the same size and varied by about three inches in width. The Scottish team took the difference into consideration when crafting and installing our windows, and the good news is that the windows fit perfectly upon installation. From the initial design meeting through installation and clean-up, the entire Scottish team exhibited a professionalism not found today in many companies. We highly recommend Scottish Stained Glass. High 5’s from start to finish. Love my two Frank Lloyd Wright inspired windows and all the different glass used. They take our new build in a historic district in Fort Worth from the usual to the extrordinary!! I would highly recommend to all my friends and new neighbors. Thank you so much. The window looks like it belongs there. It really finishes the entryway. I am so pleased I chose your company to complete the job. Your designer is very talented; excellent suggestions. Office staff called and gave the time for the installers to come. Installers were congenial friendly and professional. We are just thrilled with the service and quality of Scottish Stained Glass! Terri helped us choose a design, and gave us artistic freedom to create our own design. We were emailed within a week, an amazingly close replica of what it would look like to approve before making the windows. Our installer was so professional and polite, he worked very fast and cleaned everything up. The windows were completed 3 weeks early! We would recommend Scottish Stained Glass to anyone who wants a professional, quality, affordable, stained glass. I really appreciated Julie and Michael’s assistance with our window project. They were both always available and courteous whenever I needed anything. Thank you to both of you! The window installer was very professional, calling when he was on his way; and doing an awesome job once he arrived. The window looks wonderful. The quality is terrific and the installation was timely and well done. Would recommend Scottish Stained Glass. The piece that you designed and installed is exactly what we had hoped for and wanted. Thank You so very much for a wonderful experience. The experience was wonderful. Your team was very clear with expectations and consistently over delivered. Nicole was very good at translating what we wanted into a picture. The window turned out beautiful. The installers were very careful during the installation. Design and Install exceeded all expectation! We love our Scottish Stained Glass! I love my windows! They are stunning. This is the second home I have put them in. I am always impressed with the windows and the designer. The whole process from design to installation was flawless. The installers were professional and also gave us needed information on care and preservation of our door and windows. I am very pleased with your comany and would highly recommend it. The pieces that were designed and installed are exactly as I imagined them when I sat with Nicole, the company’s salesperson. I’m thrilled with the outcome and impressed by the service! The window arrived yesterday and fit perfectly–took me less than half an hour to install. The hardest part was freeing it from the crate. It came out great! Attached is a picture of it installed. Thanks for all of your help. Our sidelights are beautiful! The entire process went smoothly and they were ready and installed sooner than we expected. We are so glad we added Scottish Stained Glass to our home! We love the stain glass windows you designed for us. They look wonderful in our kitchen. You did them in a timely manner and they were installed in just a few minutes. Everyone was very friendly and helpful all through the process. Thank you very much for the beautiful windows. From beginning to end, the service was comfortable, professional,and extremely efficient. This is my second experience with Scottish Stained Glass and I would highly recommend them! 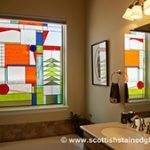 Ever since Scottish Stained Glass made a window for our Master Bedroom, we have wanted to have more stained glass in our home. We chose to have stained glass in our music room and for the large window above our front door. We are so pleased with the design for both these windows. It blends with the stained glass in our entry door, and looks beautiful. We couldn’t be more pleased. Thanks so much! Everything was very well done. The design perfectly matched our existing window, and the installation was execellent. We really enjoy our stained glass . Everyone was very professional, courteous, friendly and helpful. We will definitely recommend you to our friends and family Thank you so much! Working with SSG was a smooth and excellent experience. I highly recommend them to anyone considering a stained glass project for their home. Amazing! Our new Scottish Stained Glass sidelights are fantastic. They add an eleganttouch to our curb appeal. We would recommend Scottish Stained Glass to any of our friends. Thank you so much. The whole process was fantastic! We love the result. The design is perfect and I couldn’t be happier. I absolutely love the leaded glass panels that were made for two cabinet doors. Also, I really appreciate David Dillion’s care and workmanship. He called before the glass panels were made to ask if we would mind if he picked up the doors so he could ensure the panels would fit. That extra effort paid off and the panels are a perfect fit. 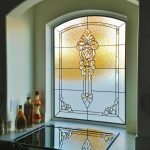 Should I need leaded or stained glass in the future, rest assured I will contact Scottish Stained Glass, and I will not hesitate to recommend your company to my friends! Terry, It is ABSOLUTELY gorgeous! We 3 are all very, very pleased with it. It lets in so much light and looks so elegant. You did a super job in helping us design it. Thanks so much. The installers are super guys too. Very efficient and fast! You can be confident that your designer knows what she is doing! Stunning work, much more creative and in keeping with the age and style of our home than anything we would’ve thought of. Thank you, Meghan. I have received many compliment on my panels just to the side of my front door. The windows are beautiful. They perfectly match the design we hoped for! Excellent company to deal with. Extremely efficient. The final installation proved to be a good decision on our part. The windows are absolutely beautiful. said left no mess. Excellent company highly recommend. Thank you so much for your help. The guys that came to house for removing/replacing leaded glass and for the tinting were very prompt, courteous, and neat. Mike was ‘on the ball’ about getting this all set up and completed. (We) certainly do appreciate everyone’s efforts and will most certainly recommend you to friends. Thank you again and please let Mike know we appreciate his assistance. the end product exceeded my expectations. You have really built an exceptional company and have staffed with professionals who really care and want to make a difference. I have learned, that values including customer focus and creating a performance culture can will only grow if displayed on all levels. You have really been success in creating this culture within your company. Many thanks to you, Barb and Julie for making this purchase, yet again, another wonderful experience with Scottish Stained Glass! We are thrilled with our stained glass sidelight window. It is beautiful, and adds just the right design element as well as providing privacy. We waited over 5 years to give ourselves this gift. We are so pleased with the design, which we feel is perfect. The service was just perfectly pleasing and we thank you. I just wanted to let you know how much we love the stained glass and lights. Not a day goes by when I’m home that I fail to marvel at their beauty. Every step went well and the sidelights were installed in less time than we were quoted. We were pleased with the Scottish Stained Glass sidelights in a previous residence. The sidelights in our new home reflect the same outstanding craftsmanship and beauty. Our experience with scottish Stained Glass couldn’t have gone any better. The designer was open to our ideas and guided us in the right direction to a perfect design. The office staff was very responsive to any of our questions or concerns. The installers were right on time and the window was a perfect fit for an odd shaped panels. Thanks to all! I absolutely LOVE it!!! It is spectacular and exceeded my expectations! Very very happy with it – thank you. I will most likely do the other 2 windows in that row, as we talked about… I am amazed at how different they look throughout the day. I am very glad that I went with the color. They’re absolutely perfect. Thanks again! I love my new windows! They brighten up my entryway and allow for the privacy I was looking for. I had two difficult areas that I needed help with. Scottish Stained Glass was the perfect solution. What was a boring and troublesome area is now one of my favorite spots in the house. From design to installation you rate an A+ in my book. I couldn’t be happier with our stain glass and would recommend you to absolutely everyone! Thank you! Everything was great. Thanks! We really appreciate the efforts of everyone involved! Scottish Stained Glass was very convenient they came to my house drafted a design and gave me a price. They kept in contact with me during the process and then arranged for delivery, showed up when scheduled, made sure they left the site as they found it and completed the installation very timely. They were top notch and professional all the way. Would recommend the highly to anyone looking for stained glass. Love my windows! 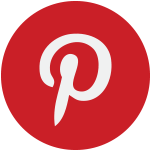 They add so much to the door and the sidelight…easy and so quickly done Thank you so much. The glass is beautiful – really changes the whole feel of the house. Installation was surprisingly fast and simple. How can we improve? I appreciated Patricia’s design ideas and the time she took to explain the process to me. I am extremely pleased with the end results. Scottish did an outstanding job of crafting the glass and installing it. All in all, avery positive experience! We love our window we had chosen for our bathroom. Beyond my expectations! Excellent workmanship and delivery. Love the door side window stained glass. Design could not have been more perfect for our home. From intial contact to completion of the project, every one was exordinarily professional. Good value for the price. Scottish Stained Glass has exceeded our expectations and a painless experience! From the initial meeting at the San Antonio Home Show with Martin, our iniitial consult from our designer Nicole, the CAD drawing rendering of our project, and finally to the installation by David, the final product is a wonderful addition to our home. If we have the need for another piece of stained glass, Scottish Stained Glass will receive our business. Thank you. We are very satisfied. The entire process was perfect – they called to set the appointment when they said they would call. Every event was on time, except installation – it was earlier than expected! The glass is beautiful – everyone who comes in comments! Thanks so much! administrative side, to David completing the installation! We have recommended you to many of our friends and will definitely do business with you again. Perfect! Excellent staff. We really enjoyed Megan and were impressed with her design work. Your staff is fabulous! Very professional, very knowledgeable, and very friendly. The whole experience of window selection and design was just as it dshould be: fun! Working with your staff was a joy. We’ve had our front door inset with leaded glass and just recently completed a window in our kitchen. Both pieces are art adding a finishing touch to our home! Everything was great… Reworking the glass and paying close attention to detail really made a big difference. We couldn’t be more pleased. I will definitely call Scottish Stained Glass to do the windows in the Morning Room. Terri Jenney is amazing. Her experience made the process so easy for us. She did a great job explaining what the end result would be based on the type of glass we considered. The window is beautiful and it still stops me in my tracks when I enter the room. My husband was home for the install and he said the installers were professional and polite. Thanks for giving us a great experience. The windows met and exceeed my expectations. There was constant follow up from rep Terri and the installers were great. These windows replaced existing stained glass windows and they look 100% better making the room a lot brighter. 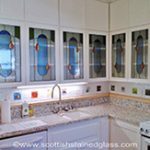 We are so thrilled that Scottish Stained Glass was able to create a beautiful solution for a very ugly problem in our kitchen area!! The window is huge and the dog-house design with sliding windows on the bottom required a lot of brainstorming to come up with a design that was contemporary and fit my kitchen. I cannot give enough accolades to Martin and his team as they were meticulous on each step of the process, design to install, and their consistent and timely communication with us made me feel very comfortable that the end result would be awesome! Each morning I sit and have a cup of coffee and smile as I admire what is more like a piece of art than a window!!!! We are very pleased with the service and product. Everything went as expected from the initial contact by the sales person, to the installer who was very knowledgeable, and the front office in scheduling the installation and answering my questions….A pleasant experience. Scottish Stained Glass turned our vision of a Charles Rennie MacKintosh-style montage of his Glasgow stained glass efforts for our door, sidelites and transom into a pleasing reality. Please us as a reference; glad to recommend your company. I cannot express what a positive experience I had with your company. Designing the window with Barb was fun and her guidance (and patience) was very professional; the installation was done beautifully and in a timely manner; and, especially, the fact that the piece was done ahead of schedule was truly remarkable and shocking. What a pleasure to work with Scottish Stained Glass and I recommend them highly. The designer was very helpful. Our side glass windows are very narrow, and the finished production is beautiful! They are really quite distracting during church. I find myself just staring at them. Others have told me the same thing. The first Sunday we had them Pastor promised not to give us a quiz after his sermon “cause he figured we’d be too busy looking at the georgous windows”. Working with our designer was so easy. Once she got a flavor for our style, her suggestions were spot on and she was creative and flexible in responding to our requests. We are delighted with our new entryway. We have been very pleased with the work and the craftsmanship of our design. Thank you very much! Great service and very professional with excellent communication throughout the entire process. Looks great! Great job, love the window! It’s classy without being pretentious. It’s the finishing touch! We are completely happy with our purchase. It was a very pleasant experience from design to install. We love the element the stained glass has brought to our home. We were very please with Scottish and their whole operation. Would certainly recommend them to our family and frieds. Megan O’Brien was great! She listened to our ideas and drew up a beautiful plan for our door. She kept in touch throughout the project. We can’t think of anything that could be improved upon. We were so pleased with the whole process from beginning to end. The windows turned out so great. Thanks again, for a job well done. I was very pleased with this company. Very professional from start to finish. The design is perfect for our door. 5 stars across the board! We wanted a custom work-of-art for our home. Scottish Stained Glass delivered beyond our expectation. We love being able to enjoy our “window art” every day. Exquisite. Yes, you did everything perfectly. We have been delighted with all of our stained glass from Scottish Stained Glass….from the initial design processes to the final installations. As repeat customers, we have found all their employees to be consistently friendly and helpful,most especially, their installers. We heartily recommend Scottish Stained Glass to anyone considering adding the beauty of stained glass to their home. The design process was fun and exciting, the designer was superb, and the installation was flawless and exactly on time. The piece looks as though it has been in the house since its initial build 114 years ago. We are thrilled – would recommend Scottish Stained Glass to anyone who wants an exceptional experience. We love our new clear story look. Thanks for the wonderful design and great service. heirloom to pass down to generations. I feel honored to have worked with such skilled artisans. Absolutely beautiful project, start to finish. Stunning and clever design work with approval drawings, excellent construction and clean installation…the best kind of work at all phases. We are very happy with our new windows. I am so thrilled with the improvements that the leaded glass made to the appearance of my home! The living room is now full of light all day, and yet I have all the privacy I want. And, at night, the glow from my leaded glass windows looks so warm and appealing from the street! Just gorgeous! I am so happy with my decision to add leaded glass to my home! The whole process was easy, and everyone involved was polite and professional… we are very happy with the final product and it looks even better than I thought it was going to. We are thrilled with our windows. They add so much to the room. We love our new window. It gives us the privacy we wanted and is much more elegant than curtains. It matches our door perfectly! Thank you! We had an excellent experience with Scottish Stained Glass. From the very beginning of the design process through installation, the designers and office contacts were there to answer any questions that we had and worked with us to get the custom design we wanted. 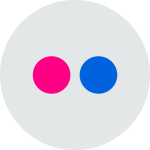 The communication through email and on the phone was smooth. Our new windows are gorgeous! Our stained glass is more beautiful than expected! We are very happy with our Scottish Stained Glass! Scottish Stained Glass added the touch of class that was needed in a couple of areas. I recommend Scottish Stained Glass to all my friends and family. Had stained glass installed in the entry way to my first home in Colorado many years ago, and now my second home. Really adds a nice touch. Everyone I worked with in the company was very helpful, friendly and professional. The stained glass is such a nice addition to our home! It turned out even better than I thought it would, it was the best I could have done to set the front of the house off, just beautiful. I am totally satisfied with the entire project. The designer is fabulous. The 3 panels of “Scottish Stained Glass” recently installed in our livingroom are such a beautiful addition. They were designed to blend perfectly with the existing glass in our home. Our experience from the initial contact, design, measurement, and installation was flawless. Everyone we dealt with was so nice and did a wonderful job. Thanks for a GREAT JOB! Thank you for the wonderful new window! Everyone did a fabulous job with the whole process. You couldn’t impress or do more. Each employee had longevity with the company, fully knowledgeable, professional and experienced. I was most impressed and happy with the professionalism and knowledge of all the staff that I interacted with during the process of designing, ordering and installation of our sidelights for the entryway. They add beauty and elegance to our home. What a joy!!! Working with Scottish Stained Glass was a pleasure from start to finish. Visiting their showroom was very helpful in coming up with a design. and friendly. The completed sidelight came out beautiful. Would highly recommend Scottish Stained Glass. We are a very happy with the new leaded glass. You were very helpful spending a generous amount time with us….the results are lovely. Also the installers were very efficient and did a great job. Our new leaded glass window gives elegance to our front entrance. Our “Aspen Tree” design is absolutely beautiful. The window turned out so much better than we envisioned it. Now we have to show our guests our master bathroom so they too can see the beautiful window. Totally changed the look of our home. Love it and well worth the money. Martin, the stained glass arrived safely and I just wanted to send you a quick email to thank you for everything. We were so impressed with your customer service. Megan was an absolute delight to deal with and her beautiful design and the quality of work were far more than we had ever expected. The stained glass is the first thing you see when you enter our house and we have already had a lot of “wow” comments from friends and neighbours. Our new sidelight is elegant and gives our entry way a soft, classy look. We are thrilled with the effect and so happy that we chose Scottish Stained Glass. The designer was knowledgeable and helpful, and the installers were fast and efficient. The whole process was a pleasant experience. professional. The workmanship on the entire piece is world class and recognizably enhanced our home. We recommend Scottish Stained Glass to everyone who will listen. work of your artisans shines through and will certainly be the envy of our neighbors! Thank you so much for giving us the opportunity to support abusiness that manufactures their products in the USA! I had a great experience with Scottish Stained Glass. My designer, Aimee, showed up fully prepared. I did not have to think about anything too much. She had all the sample stained glasses and ipad with all the different designs. Once I had narrowed down some choices she drew the sample to scale which helped a lot in making a decision on the design I chose. Within a week I had a CAD with 2 different choices from my designer, which was great so I could see exactly what the stained glass would look like before I proceeded. Lastly, the installer was timely and was great about communicating with me when he was available and showed in in a timely manner. Overall a great expereince with Scottish Stained Glass I would recommend them to everyone! Thanks! The window arrived today and it’s absolutely exquisite! I LOVE it! I knew it would be beautiful, but the finished product far exceeded my expectations. Please share my comments with Barb, and extend a huge THANK YOU to the entire Scottish team who had a role in its production! We cannot begin to tell you how happy we are with Scottish Stained Glass. The designer, the installer and the final product are all wonderful. We plan on using Scottish Stained Glass again for a much large window over our staircase. We would very strongly recommend this company to anyone who is looking for either stained glass or leaded glass. Thank you. The piece that was created and installed is lovely. It will be something to hand-down to my children. The stained glass is beautiful. I am so impressed with the whole process with Scottish Stained Glass. Great staff, great work. Everything was done in a timely manner and the installers were terrific. I would recommend Scottish Stained Glass to everyone. Our window is absolutely beautiful! It perfectly complements the side panels, which we had done by Scottish Stained Glass Co. several years ago. It was fun to sit and work with the designer, who was very patient with us, and the installers were courteous, efficient and did an amazing job. Everything was done in a very professional manner and in a much less time frame than originally quoted. Thanks for that! Love the windows! Everything is perfect. The stained glass is beautiful. Such an asset to my home. Highly recommend Scottish Glass. Simply a wonderful experience. I love my window it enhances my entryway to no end! Everything was perfect. I could not be happier with my stained glass. From sales to installation, the process was smooth and professional. done in a timely manner and the men who came to install were great. Thank you very much. Really beautiful window!! It turned out even nicer than I imagined. Thank you to all. My wife and I were very satisfied with the professionalism we received by your sales and installation personel. We are very pleased with the 2 windows installed. They give the house a more personal touch. Everyone who has seen the window you made, absolutely loves it. My contractor said it was outstanding work, and he used to own a window company and has done stained glass work in the past. My other friend said that when she saw the pictures, they gave her “chills”… that response is better than any words could ever convey. You nailed it, thank you so much. I want to thank you for your beautiful design on our window. It is gorgeous! We just love it! We’ll have to do the small windows over our picture window sometime! Everything was fantastic. It was a great experience. There is nothing that could be improved, the time it took to design and install were both very good. The two windows that were designed and installed for us are excellent. They add a richness to our home and provide some privacy to our living room. 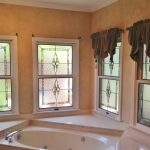 You did everything perfect… Make no mistake the windows are very very pretty and will feel they will be a beautiful focal point of our master bath renovation. When all the tile and marble has been installed we will send you a photo. Our new windows will be a gorgeous focal point of our newly renovated master bath!! everything was outstanding! The finished product was even better than I imagined it would be! Great product, great service and great people! Among the best overall experiences we’ve had when working with any manner of construction service. The end result is beautiful. We couldn’t be happier. We were greatly impressed with everything about Scottish Stained Glass, from the time we walked in the door through the installation of our windows. The staff, the service, the installers, all first class. Everything was done as promised and in a proffesional manner. It looks great, thank you. Your leaded glass designed for my corner kitchen cabinet is a focal point in the kitchen and makes my new kitchen remodel look very classy ! Everyone, absolutely everyone who sees it just loves it ! Thank you! Hi Mike and Megan. We wanted to let you know we are very happy with the stained glass that you created. On top of that, Larry did an amazing job installing it. Many of our friends and neighbors were impressed by the look and quality of the finished product. it looks like it was always part of the house as opposed to a new addition. I think the process went pretty well. Aimee made it easy for me to help my client decide on the components of the glass and he was very pleased with the finished product. Great assistance in designing the stained glass project. Everyone was truly great and provided excellent customer service. Will use again. Everything was great! Wonderful to work with! I love my scottish stained glass. It’s beautiful. This is my second time using Scottish Stained Glass. Besides working with professional and lovely people I have been extremely happy with thework they do. 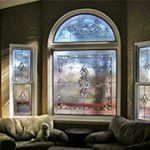 I would use them again and recommend them to anyone who needed a stain glass window! The stained glass window exceeded our expectations. The Installers arrived early, were professional and did a neat and clean installation. We love our new side light. It is the second time we have done business with Scottish Stained Glass, (the first being about 5 years ago), and we love the looks and durability of the product. It has been a great experience working through the process with the designer, through the installation. Top notch Company and product. Designing my window was so fun and seeing the outcome was even better than imagined. We loved our experience with your company. We can’t wait until we can order another window in the future. Thank you! Perfect! Looks great! As a repeat customer, we are very pleased with the quality workmanship and finished product. We love it! it would be a lot more expensive. Everyone was so helpful and seemed to really love their jobs. I love my new leaded glass windows. It adds the elegance that I was looking for in my entryway. Everything was perfect. Very fun experience. SSG worked with my idea and budget and gave us a gorgeous window. Everything was perfect. Every one was professional and polite. I am thrilled with our Scottish Stained glass, from start to finish. Our door and entryway look awesome! Very courteous service. Our designer was very knowledgeable and helped us get the most perfect design. We couldn’t be more pleased with the service and final product. We were very happy with the whole process. The windows are just beautiful. We love our new windows. They are exactly what we had wanted–giving us privacy while providing us light in the master bath. We wish we had done it years ago! Beautiful end result for our 3 small windows, the final product was exactly as designed. This is one of the best choices I could make for our new home. of thoughts from our heads and put them on paper. The installers arrived on time, were respectful of the house and keeping things neat and clean, as well as doing a fantastic job. Everyone was a joy to work with. Our windows, sidelights and transom were just installed yesterday, and I am thrilled with the way they look! I will forward a couple of pictures to you so you can see the finished product. Thanks so much! I would anticipate people noticing the lovely windows and asking where we got them. I will definitely tell them to contact Scottish Stained Glass. This was one of the best purchase and installation experiences that I have had. Everyone was professional and great to work with. When the window was installed, it was done quickly and professionally with great attention to detail and clean up. Thank you! Now that I see the transom piece in place I can’t believe we put off this final piece for so long. It totally seems worth the expense now that we see how complete the entry looks. As for the Celtic Knot, I am completely in love with it! I was afraid it might make the room look too dark or claustrophobic, but it has done the opposite, making that wall look taller and the room brighten with a soft glow. Thank you so much for your help with our designs! Tim installed the windows today. We’re very pleased with both the windows and Tim’s installation. Susan and will inform our friends about you as soon as they ask. Hi Barb – I was absolutely floored when I came home yesterday and saw the oo-la-la window! Oh my gosh it is so gorgeous! I just love it! Thank you for designing a window with me in mind! Now, my husband did not tell me that your guys were coming to install the glass window, so I did not get a chance to remove the window tinting film that the former owner had applied. If we think it should be removed, because it is hard to see the beautiful window from outside, what would the charge be? I already took pictures to send to my Mom, so I will be happy to send you some AWESOME feedback as well as a picture or two. I just wanted to thank you for you help with the kitchen stained glass window and let you know how pleased Bob and I are with it. beautiful artistic talents! Please thank Mike and Julie for everything they did as well! Very satisfied in Park City! Received the stained glass piece yesterday – It is gorgeous!!!!!!! Thank you soooooo much!!!!! I am thrilled and know Criag will LOVE it!!!!!! Please let Abby , Michael and Martin know how pleased Chuck and I are with our window!!!!! Everyone who has seen it, even workmen, have commented on how fabulous it is!!!! Scottish Stained Glass does beautiful and high quality workmanship. This is the second area that they have designed for us and we are very pleased. We would highly recommend them to our friends. Was originally looking for someone to replace 3 panels in my standard front door. Amie was great in providing me cost to replace options & then discussed what a redesign would cost. After reviewing some images on her iPad & selecting from some glass samples, I am proud to say that I went with the redesign option and I decided to have my side light window done as well which accents the prominent design in the door. When Juan came out to measure & install, he was courteous & professional. Great custom design & creations. It was affordable & beautiful. Can’t wait to have my kitchen & bathroom windows designed next. The glass is absolutely beautiful and everyone loves it!! We can’t thank you guys enough! We are not sure if we can get any more pieces approved at this point, but our Student Government sponsors as well as some other organizations here at Mountain Range expressed interest in using Scottish Stained Glass for future projects! I will be getting your information to all of them and hopefully we will be able to continue putting up your beautiful work! I will most definitely get some pictures on a disk and send it to you asap! We absolutely love the stained glass windows! They are just beautiful and afford a wonderful welcome into our worship center…. Bottom line is that we are very pleased and very grateful. You should definitely get a picture for your book. I just wanted to let you know that my windows arrived yesterday, and they look just beautiful! Thanks for being patient with me, so that I could make sure I got exactly what I wanted. Again, many thanks. They are just lovely. From start to finish it was a great job!!! We loved working with Jill because she listened to what we liked in our designs. I absolutely love the sidelight! My designer listened carefully to my suggestions and truly made a piece of art! The stained-glass panel arrived today, borne by a brave, brown-clad UPS stalwart who carefully transported our treasure down the icy slopes to my stoop. You were correct- it is much more a thing to behold in the present eye, beyond description. We shall refer to you in all things of professionalism and creative brilliance. A thousand appreciations to all involved! I just wanted to say thank you for my beautiful new window. I couldn’t be more pleased with how it looks. My friends will hear about your company. Woody installed the window on Saturday. It turned out fantastic – exactly what I wanted! Presently the bathroom is completely demolished (except for the beautiful window.) as we are in the process of remodeling. Once it is complete I’ll send you a picture of the how the window looks in the new, improved room. Many thanks for everything. You and your staff have been a joy to work with. Fantastic windows and my designer really understands how the color will look once installed. I wasn’t sure but they’re absolutely a perfect match for my existing 108 yr old windows. Reasonably priced, very fast, and efficient. We have had our Scottish Stained Glass windows in place for over three years. We got them quite quickly after moving into our brand new home! We still get rave reviews and compliments, and we will never tire of the beauty they bring into our lives. A few months ago, when I couldn’t sleep one night, I sat on our sofa at some crazy hour like 2 a.m…. the moon was just at the right place to shed light through our windows, and I marveled anew at the twinkling rainbows and gorgeous glow that luminesced through our windows! Thank you again for the creativity and craftsmanship and quality you provided for us to enjoy! My husband and I are so happy with our window. It is beautiful and a perfect fit. It is just as attractive at night as in the daytime! Thanks for a wonderful job! We are very pleased with the new window! Although we had initially just wanted to replace the old window with something that would not be an eyesore, this new window has gone above and beyond and is now the focus of the entire family room. We immediately rearranged our furniture so all those seated in the room can enjoy the view. Mike and his crew did a top notch installation, and I’m excited to finish off the woodwork. Just in time for the holidays — it’s sure to be a conversation piece for the gatherings we have planned! Thanks for your assistance, and please extend our appreciation to Martin — what a superb piece of artwork! We couldn’t be more pleased with the windows. They make the bathroom awesome! Abbey was wonderful to work with. We changed the designs many times. She worked with me until we got it right. The end products are beautiful! I wanted to take a moment to let you know how wonderful the art glass looks in our master bedroom. We are delighted in the design and functionality of the piece. We are sleeping more peacefully, our space is dark at night, and we are not waking with the crows. Thank you, and your staff, again for the professionalism and quality workmanship. Our experience with your company is worth praise and referrals. We look forward to doing business with you in the future. Our leaded glass side light is beautiful. Our designer understood the level of privacy we wanted as well as the look we had in mind. The glass arrived in perfect condition…absolutely perfect… the choice to do the color, and that color, was right on the money. It really finishes up the look of the bathroom. I will email you a photo as soon as I am home in the morning when the sun comes up. I couldn’t be more pleased. Thanks for your wonderful services. The window is just beautiful. Aimee did a great job on the design, tying it to the design in the existing door but keeping the door as the focal point of the entry way. The installer was very professional and meticulous. I love my sidelight and am well pleased with the professionalism and speed of the entire process. We thought the process was great, everyone was very courteous and we love how our stained glass turned out. You have a very good company because of the people you are working for you, and the quality of work you do! Thank you! We will recommend you to others. I am absolutely delighted with my window. It is like an art work in my home. The designer did a beatufiul job and the finished product is more beautiful than I could have imagined. And the price was reasonable for a work of art. Wish I had more spaces I could add a new window. This is one of the best things I have added to my home. We are thrilled with our window. When the sun comes through in the morning, it is lovely. We absolutely love our glass. It exceeded our expectations – we’re sorry we didn’t do it sooner! The quality and workmanship is exceptional – can’t wait for our friends to see it. Beautiful work, brilliant designer! It all came together so nicely. Thank you! Guy and the team did an excellent job. 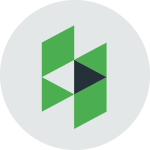 We initially worked with Scottish Home Improvements when their crew put new James Hardie Siding on our home. We then followed up with Scottish Stained Glass part of the company due to our positive from the “get go” with Abbey and her wonderful attitude to help ups get exactly what we wanted. the installer was also on-time and very pleasant to my wife. Thank you again and we will recommend your company to anyone who wants or needs this service. We highly recommend SSG. We selected SSG for a Platinum LEED demonstration home and are so excited by the results. Abbey and your staff deserve some serious loving for the outstanding customer service. Thank you! Great designed product and service. Nothing but good comments! Every aspect of your company is absolutely the best. We have had some pretty difficult designs, but everyone has turned out even better than I could hope for. We just stand back and admire each window every day. Everybody that we have dealt with has been just delightful. I have told everybody I know that if they need stained glass, Scottish is the place to get it. Job was done exactly as discussed. As a business owner myself I couldn’t have asked for a better job. Your company performed in the same fashion that I would expect from my own company. The windows are strikingly beautiful; I especially enjoy the sunlight playing on my living room window in the early morning thru the new stained glass windows. The colors are gorgeous! You should use my windows in your brochures because the design and colors are so perfect. Julie did a great job design what I wanted. Dear Mary Anne, Thank you so much for your assistance in designing our lovely windows…they add yet another beautiful glass element to our new home…we will recommend your business highly. The beautiful window has touched my heart so very much… – With much gratitude. Thanks for your great value, high quality, low cost. Thank you so much for the quick installation and beautiful glass. …I am thrilled with my windows… when people see the windows they cannot believe they are in a basement. Thank you again for your beautiful work. We are extremely pleased with the custom glass windows that you designed and installed in our home. They are a delightful topic of conversation… They truly give our home a sense of individuality. We enjoy the refracted “play of light” from the beveled pieces. From my first contact to the last, you guys are great. The glass is beautiful. You did a great job. Thanks to everyone involved. The leaded glass window adds a depth and beauty to our house; it’s a visual delight. Thank you – It was a pleasure working with you. Thanks to all the staff that made the installation of our window so enjoyable. We were pleased with every aspect of the treatment we received from your company. From the initial sales appointment with Thomson to the two installers who pleasantly and professionally installed the windows. We look forward to recommending your services to others. Thanks again. Thank you for such a beautiful entry way, everyone loves it!! I will definitely recommend everyone I know to choose your team. Thanks again. Thank you so much for partnering with us in the Parade of Homes. We had many inquiries from Parade visitors about your beautiful leaded glass. It is a design detail that truly makes this custom home a beautiful work of art. Martin, I love my window. Thank you! I could not have been more delighted with my stained glass windows. They have been the best gifts I ever gave myself. …The glass is beautiful and adds so much charm to our home. …We love our Scottish thistle stained glass! Our friends next door want a colorful piece too! Thanks so much! It looks awesome! Thank you so very much, it was exactly what I wanted! Thank you for working so hard to get our windows ready and installed by December 19th. The windows are beautiful! I am very pleased. Thank you for excellent work on our sidelights…. I love looking at them day and night. It was a pleasure working with you. …We are so pleased with the leaded glass archway and side panels you created for the entryway of our house. It looks lovelier than I imagined… Well worth the money! Thank you for the new windows. We are very happy with how they turned out. I waited many years to do this; I am very pleased with the results and all staff. I appreciate good customer service. – Thank you! A very nice addition to our home. We are very pleased. Friendly staff. My windows look awesome! Thank you so much! I have decided that I would eventually like to do my back door! Jill was great!! The installers were fabulous!! Great staff!! The window looks very good, makes a big difference. Excellent service and satisfaction in all areas. Great service- Appointments were prompt. Helpful with design – looks just like what I expected. Absolutely thrilled with the finished glass on every window Martin has designed for us! Installers were on time, quick, and efficient. Very pleased with the results. Thank you. Thank you for the 22 beautiful windows you and your staff created for us. Thompson has been a great designer, Mary Anne is always very helpful, and your installers have been very good. Best to you and to your staff. Your installers were outstanding!!! Your designer did a super job helping us!!! We love our windows!! Even more beautiful that I expected! Thanks to all of you! Excellent work and design. We feel our townhouse is a “showcase” and that these windows will only increase the value of the townhouse when – if we ever sell. Thank you. Everyone did a great job. We really appreciate it. Excellent & shall make referrals. We’re really enjoying the leaded glass. Great company to do business with. Beautiful glass. The finished glass is beautiful and will my neighbors envious! Thanks so much! The windows look fabulous!!! Every member of your staff was great! We are so pleased! The glass is beautiful. Exceeded our expectations. Wonderful service and beautiful product.